Home Home Bring In The UN Pension Peacekeepers? Bring In The UN Pension Peacekeepers? The United Nations needs some financial peacekeepers. A dispute over whether new regulations governing the $54 billion UN Joint Staff Pension Fund will result in higher fees paid to outside bankers or modernize oversight of the 67-year-old trust has divided fund CEO Sergio Arvizu and union leaders, sparking accusations of mismanagement. Lost in the fight is the fund’s performance: the account returned 5 percent the past decade, according to a June 30 report by Northern Trust Corp. That 10-year performance compares with 5.1 percent for the California Public Employees’ Retirement System, the largest in the U.S., and the 5.7 percent median for U.S. public pensions, according to Keith Brainard, who tracks pensions for the National Association of State Retirement Administrators. Yet internal rules approved this month that shift authority over issues such as staffing and budgeting from Secretary-General Ban Ki-moon’s office to Arvizu have fueled the spat. At stake is a fund with more than 126,000 participants which pays about 71,000 retirees in 190 countries. Those payments go out in 15 currencies, including dollars, euros, kroners and rupees. “We have arguably one of the most complex pension plan designs,” said Arvizu, a 55-year-old former director of investments at Mexico’s social security institute, via e-mail. Adding to the complexity is the pension’s structure. Arvizu oversees benefits and operations and reports directly to the UN General Assembly, the main body representing all 193 member countries. The investment division is headed by Carolyn Boykin, a former president of Bolton Partners Investment Consulting Group. Boykin reports to Ban. The fund’s broad investments are typical for a pension: it holds 61.3 percent of assets in stocks and 29 percent in fixed income, according to an internal report. It also has 6.9 percent in categories such as real estate, timberland and infrastructure and 2.7 percent in alternative investments, including private equity, commodities and hedge funds. Moreover, the UN pension is 91 percent funded, above the 73.7 percent median for state pensions, Brainard said. If a plan can meet its projected payments, “it’s in good shape,” he said. With backing from the UN General Assembly, Arvizu in 2014 began campaigning for changes he said were needed to modernize pension management at an institution famous for its Cold War-era bureaucracy. His argument: running an investment fund can’t be judged the same way you measure success for a humanitarian mission. The union pushed back, seeing in the proposals the potential for managers to direct more investments to external institutions, undermining UN oversight and undercutting returns. In a letter to members last year, Arvizu said he was facing a “malicious campaign with gross misrepresentations.” The allegations triggered an internal investigation by the UN’s anti-corruption watchdog, which cleared Arvizu. Fund officials reject the idea that they are planning to outsource management. Yet Arvizu, who joined the UN fund in 2006, argues he does need flexibility to hire and promote employees with specialized experience. “The expertise to carry out this work — including entitlements, risk management, plan design, asset liability management, and client services — are different from other parts of the United Nations system,” he said. The UN also needed to adopt modern tools for measuring risk and ensuring transparency, he said. Asset liability management studies, which help managers assess risk and strategy, “were not done before in the fund,” Arvizu said via e-mail. Relations between management and the unions soured further when benefits management software installed in 2015 had delays enrolling beneficiaries. Thousands of new retirees, some of whom had to wait six months before receiving payments, were enraged. According to an analysis by the UN union, the fund faces “significant concentration risks’’ from its two biggest portfolios, North American Equity and Global Fixed Income, which combined account for $30.5 billion. Two senior investment officers run these funds and vacancies in risk management have not been filled. That’s now underway, Boykin said, hinting at the fund’s broader concerns about bringing capable professionals into the global body. “The hiring process at the UN is lengthy,” she said. Union leaders say they’ll keep pressing for the backlog of beneficiary payments to be fixed and on management to scale back the scope of the new regulations. But like other battles at the UN, little can happen quickly: the next fund review won’t take place until July 2017. The last time I covered the UN’s pension fund was last year when I discussed the United Nations of Hedge Funds. I see things are only getting worse at the United Nations Joint Staff Pension Fund (UNJSPF). […] the real problem is investment underperformance, YTD 190 basis points BELOW the policy benchmark followed by dismal performance in 2015. The story I was told was that the recent attacks on the CEO (who doesn’t manage the investment portfolio) were a diversionary tactic. The purpose was to distract the audience from the dismal investment returns since the current Representative of the Secretary-General (RSG), Carolyn Boykin arrived and put a stop to tactical asset allocation. The Chairman of the Investments Committee and the Director of Investments left shortly after Boykin’s arrival, as did the Chief Risk Officer. Very ugly. Ah, the United Nations, a vast organization full of important diplomats debating the world’s entrenched problems. I have tremendous respect for the UN and even joined McGill’s model UN club during my undergrad years where along with other students, we got to visit Princeton, Harvard, Columbia, Yale and Univ of Pennsylvania to simulate UN committees and debate other university students on key global issues. We also visited the United Nations on a few occasions (only from the outside). And we performed exceptionally well and won many model UN events. There were a lot of very talented students representing McGill University back then (much smarter than me), including Tim Wu who is now a professor of law at Columbia’s Law School. Tim is credited with popularizing the concept of network neutrality in his 2003 paper Network Neutrality, Broadband Discrimination (Tim is a genius, had a 4.0 GPA while studying biochemistry and biophysics at McGill and then went on to study law at Harvard. He was also one of the nicest guys I met at McGill). Anyways, enough reminiscing on my model UN undergrad days, let’s get back to the real UN and its pension woes. My contact sent me a recent critical analysis of the pension fund’s management and performance done by the UN Staff Union which you can all read by clicking here (note its date, July 2016). Now, if you take the time to read this report, you’ll see it’s pretty scathing. There are some concerns that I agree with — including the sections on performance, risk management, governance and the way tactical asset allocation decisions are taken — but there are parts where quite frankly, I thought it was a bit ridiculous and too harsh. So what? Blackrock does business with everybody which is why it’s the world’s largest asset manager and able to attract talented individuals like Mark Wiseman to its shop. 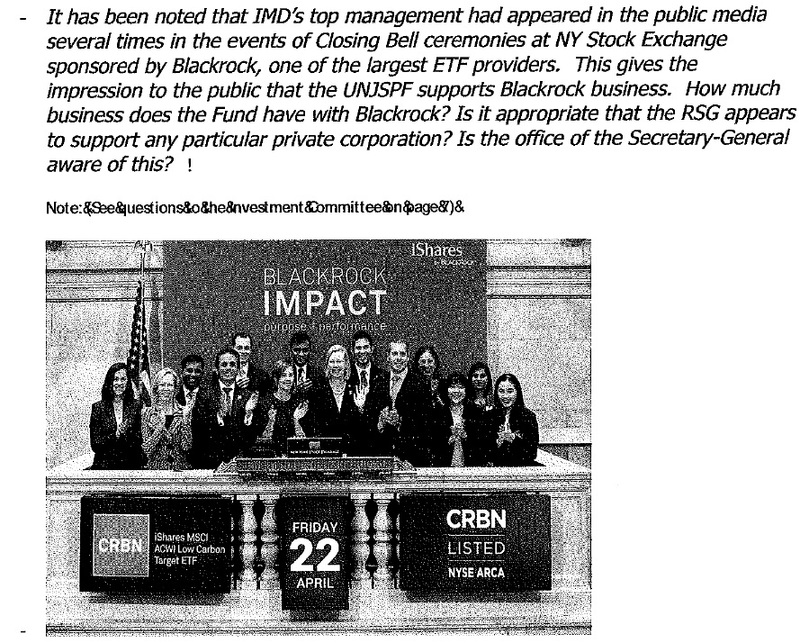 The “Closing Bell” appearance was a very sore subject within the Investment Management Division, (IMD) because the staff who worked on the Low Carbon Index project, which was completed BEFORE Boykin arrived at the UN, were not invited to the event. Boykin wanted to take full credit. Ok, so maybe Boykin might be a narcissistic power hungry leader (I don’t know the lady) who wants to be the center of the universe. She won’t be the first nor the last alpha type at the UN which is a notorious breeding ground for such personalities. Unfortunately, there may be more to this story. 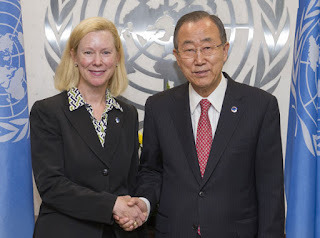 According to the UN Pension blog, when Secretary-General Ban Ki-moon appointed Boykin to the UN Pension Fund as his Representative for Investments in September 2014, rumors swirled like snowflakes that the new RSG had a spotty record — something to do with the Maryland State Retirement and Pension System where she was Chief Investment Officer from 1999 to 2003 (read the background here). I can’t comment on Ms. Boykin’s personal qualifications. I’m sure she’s qualified or else she wouldn’t have been selected for the job. As you can see, the YTD performance of the pension fund relative to its policy benchmark is weak (5.06% vs 6.96%) but I wouldn’t read too much into one year’s performance. It’s meaningless for pensions which have a very long investment horizon. According to the Bloomberg article above, the account returned 5 percent over the past decade, which isn’t great but it’s in line with what other large US public pension funds delivered during that period (Canada’s large pensions vastly outperformed their US counterparts during the last decade). More importantly, the article states the UN pension is 91 percent funded, above the 73.7 percent median for state pensions. It’s the funding status of the plan that ultimately counts and on this front, there are no alarm bells ringing. Having said this, if the governance is all wrong, you can expect weak performance to persist and the funding status of the plan to deteriorate, especially if low and negative rates are here to stay. And don’t forget, the UN pension is a mature plan, meaning there is little room for error if its pension deficit grows. And it’s the governance of the UN pension that really worries me. Just like many state pensions, it’s all wrong with far too much political interference. The UN pension needs to adopt the same governance rules that has allowed Canada’s Top Ten pensions to thrive and become the envy of the world. It needs to adopt an independent, qualified investment board to oversee the pension and hire experienced pension fund managers to bring assets internally and save the pension a bundle on fees. Before it does all this, the UN needs to perform a thorough operational, performance and risk management audit of its pension. And I mean thorough and not the politically sanitized version. Have it done by Ted Siedle, the pension proctologist, or better yet hire me and my friends over at Phocion Investment Services here in Montreal and we will provide you with a comprehensive and detailed audit report on the true health of the UN pension. The city has world class universities, a diverse population and many fluently bilingual and multi-lingual finance and economics students with MBAs, Master’s and PhDs. Two of the largest Canadian public pension funds, the Caisse and PSP, are here and there are great private sector pensions here too (CN, Air Canada, etc.). There are many experienced pension professionals who can manage assets internally at a fraction of the cost of what it costs the UN to farm assets to external managers, many of which are underperforming. Of course, this assumes the UN gets the governance right, allowing its pension fund to compensate ts staff properly. Moving to Montreal would not only cut costs, it would distance pension managers from the politics of the UN’s General Assembly. Rents are much cheaper in Montreal and it’s a short plane ride away from New York City with no time difference. The UN should really consider the pros and cons of moving its pension management division to Montreal. I can put together a team of highly qualified investment managers with years of experience at a moment’s notice (not holding my breath but I’m dead serious on this recommendation of moving the UN’s pension operations to Montreal). But before the UN even contemplates this suggestion, it has to first fix its pension governance so that potential candidates will want to come work at the UN pension fund. Why not fix the governance and hire people from New York City where financial talent abounds? Yeah, it can do that but it will cost the UN a lot more money and I strongly doubt they will get a better long term performance. Those are my thoughts on the UN pension. As always, if you have anything to add or just want to reach out to me, feel free to send me an email at LKolivakis@gmail.com.